The Palestinian Health Ministry reported that two Palestinian civilians, including a photojournalist, were injured on Friday at the border protests, and died of their injuries overnight. The two were wounded when Israeli soldiers attacked protesters who were gathered in the north, east, and southern borders of Gaza. They were identified as Yassar Mortaja, 31 (journalist), and Hamza Abdul-al, 20. Dr. Ashraf al-Qidra, spokesperson of the Palestinian Health Ministry in Gaza, said that photojournalist Yassar Mortaja, 31, died of a gunshot wound he sustained on Friday while documenting the protest. 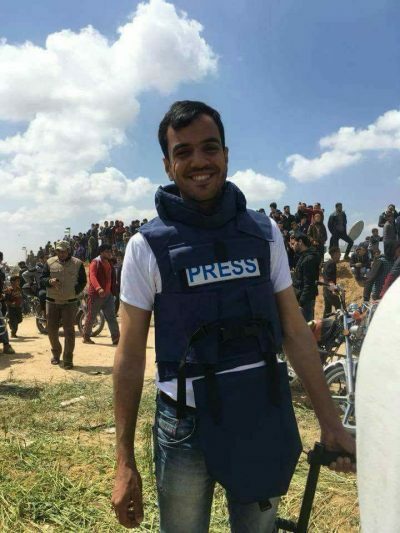 He was wearing a Press vest and was clearly performing his duty as a journalist when he was targeted by the Israeli sharpshooters stationed at the military base on the Gaza border. 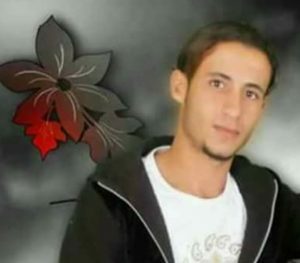 Dr. al-Qidra reported that Mortaja was shot with a live round in his abdomen while covering a protest in east Khan Younis, near the border fence that imprisons Gaza. He was rushed to the hospital, where he died after several hours. The Palestinian Journalists Syndicate condemned the killing of Mortaja, and called on international journalist organizations to take a stand for the journalists in Gaza, who are being directly targeted by Israeli forces. 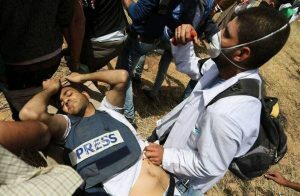 In addition to killing Mortaja, the soldiers shot and wounded seven journalists who were covering the protests in Gaza on Friday April 6th. The Syndicate said they intend to take the case of Mortaja to international court, and to international organizations, and to call on the United Nations to stop the violations, and to implement their own resolutions condemning Israel’s repeated attacks on journalists. Hamza Abdul-al, 20, from Zoweida village in Deir al-Baleh District in central Gaza, also died Friday night of injuries sustained during the protest earlier that day. Dr. Ashraf al-Qidra of the Palestinian Health Ministry confirmed his death at the hospital where he was taken after being shot with a live round by Israeli forces. Following the death of the two Palestinians, Dr. al-Qidra said that the Israeli soldiers have killed ten Palestinian civilians in Gaza on Friday April 6th and injured 1,354, including 491 shot with live rounds and expanding bullets. 33 of those who were shot are still in critical condition. Doctors at the Gaza Central Hospital reported that many of those who were injured by live fire were hit by expanding bullets, which tear apart internal organs and tissues once they enter the body. These types of bullets are illegal under international law for use against a civilian population.